Coming soon. All cards will be available after release. Capitalizing on the tremendous success of the 2015-16 set, 2016-17 Upper Deck Tim Hortons Hockey largely picks up where it left off with another promotional release. Packs are available for purchase at participating Tim Hortons locations beginning on September 21. Just like last year, 2016-17 Upper Deck Tim Hortons Hockey packs are exclusive to Canadian locations. Those that make a drink purchase can buy individual packs for $1 CAD and the packs go for $1.99 CAD without a paid beverage. Beyond the very limited cards signed cards for Crosby and MacKinnon, the other premium inserts are still quite tough to hit. The NHL Autograph insert includes 15 players, while 18 players comprise the NHL Relic set, including Alex Ovechkin and Connor McDavid. Finally, six cards pair both a relic and signature on the same card with NHL Autograph Jersey. There is also an NPN aspect to 2016-17 Upper Deck Tim Hortons Hockey as well as a digital format. Full details can be found at the official Collect to Win website. 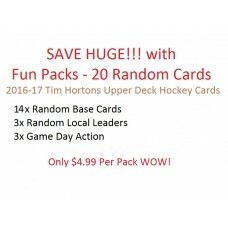 The 2016-17 Upper Deck Tim Hortons Hockey promotion takes place from September 21 to November 2, 2016, or as supplies last. It has been revealed that at least 9,375,200 packs will be produced. You will receive the foll..